Separate Entrance. Smoking Section outside secure high wall with safe parking. In safe boomed off area. Marble and wooden floors. Lapa with braai bar facilities available for private functions. Swimming pool. Nestled in Palm and Water Featured Garden. New Additions Internet and washing machine in suite. 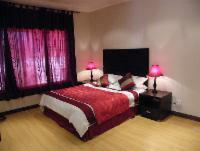 Rate R1000 per unit per night .EFT credit card, Master, VISA and Diners at 5% discount given for cash payment. Credit Card Imprint taken as Deposit but returned on checkout is no breakages. Special themed arrivals of champagne or sparkling wine, chocolate, Strawberries and flowers can be requested at extra cost on arrival. Welcome basket for first meal can also be arranged. Leather couches in the lounge, fold down luxury double sleeper couch, TV, DStv with full bouquet including BBC, Sky and CNN, computer desk, ADSL connection ADSL over power- free up to 250 MB. Spacious Main bedroom consist of queen-size bed, air cooler, hairdryer, safe, iron and ironing board. Dressing area, walk in dressing area and top loader washing machine. Bathroom with modern marble tiled, glass separate shower, Jacuzzi bath bath foam supplied toilet, towels provided and washing line. Outside front with water featured garden with palm trees, lapa, braai/barbeque area, gas braai/barbeque and swimming pool. EFT credit card, Master, VISA and Diners at 5% discount given for cash payment. Credit Card Imprint taken as Deposit but returned on checkout is no breakages. Comfortable and clean - however, we had to ask for the ironing board and iron, and the cooking utensils such as pots/pans etc. were in stark contrast to the rest of the well-appointed and finished suite. The kitchen kit requires review e.g. provision is made for poaching eggs, but there isn't even a colander for draining veg/pasta! Once wet, the tiles inside are dangerously slippery, especially for kids! We really enjoyed our stay at Littlefields and can recommend it. Littlefields Luxury Suite is 12.6km from the centre of Johannesburg , the nearest airport 14.7km (Lanseria International Airport).